Having graduated from English High School (Nişantaşı Anatolian High School) and Arrowhead High School, USA with high honor degrees, Duysal Aşkun completed her undergraduate and graduate degree in Psychology from Boğaziçi University also with high honor degrees. At 2000, she started her professional life in Nestlé Turkey Human Resources department. She then continued with Colgate Palmolive Turkey Sales department as an Account Manager assistant and then as a Customer Marketing Business Analyst. In the last quarter of 2002, she moved on to take a specialist role in Acıbadem Health Care Group. During her years in the group, she took on many projects related with the call center agents and also designed & conducted many training and consulting projects with the health care personnel and the managers. In addition to her roles in those organizations, she worked as a freelance trainer and a consultant with several training & consulting firms such as RCBA Door and UykuTulumu between the years 2002-2007. At 2004, she became a founding coordinator for Turkey as part of an NGO Humanity’s Team Worldwide which has 15,000 volunteer members in 90 countries. In her last two years in the organization, she has served as a Worldwide Teams and Operations Coordinator. As part of her global role, she formed functional teams with many volunteers from distant locations and managed their HR processes. After five years of doctorate work in the Organizational Behavior branch of the Department of Management in the Marmara University, she has completed her PhD degree with her thesis “Quality of Work Life in Call Centers” in 2007. With her thesis research, she has developed an organizational model regarding the organizational inputs that are necessary to reduce turnover intentions of employees working in call centers. Having started her own company in 2004, Dr. Aşkun Çelik has been working professionally under the areas of organizational training, human resources processes & functions, leadership & teambuilding, executive and career coaching. Duysal has worked with some major institutions and corporations as IFC World Bank, ZQAN Azerbayjan, Koray Construction, Acibadem Project Management, Novartis Turkey, Borova Construction, Biruni Labs, IB Tech, Polimeks Construction, SGS, Zarakol, Corio Real Estate, Tribecca Communications, Dia Holding, IKEA, Yapi Kredi Pension Trust, Botek Automation, Sinangil, Unilever, International Power, TUI & Hotelbeds, Nestlé Turkey, Dogan Online, Oyakbank Call Center, BAT Tobacco, Atalante Tour, Flokser-Suetser, Anadolu-Bil Education Institute, and BPO-IBM. In the beginning of the year 2017, Duysal started giving consulting services for a Business Incubator at Silicon Valley and helped launch boot camp and accelerator programs with Starturk Inc. The main idea was to help young entrepreneurs and start-ups to enter into the US market through right channels of operation and investment. On an academic level, Duysal Askun Celik conducts research in the areas of Micro-organizational behavior, mindfulness, oneness behavior and oneness at the workplace. Currently, Duysal is teaching at Fordham University Gabelli School of Business as an Adjunct Faculty. Having graduated from the Istanbul Technical University in the year 1987, Cem Kafadar entered Garanti Koza Construction Company in 1988. For 10 years, he held many different positions as a Site Manager, Technical Office Manager, and as an Assistant Project Manager. Between the years 1998-2004, he worked as an internal audit specialist, planning supervisor, and work health and safety specialist in Alarko. In 2004, he continued his career in IKEA Ümraniye as a Technical Manager. At 2006, he started his own company about online consulting services. And, at the year 2007, he became a founding partner of Bilişim Reklamcılık Ltd and started collaborating with Smart Solutions. Cem Kafadar is the founder of several online recruitment services websites such as 1insaat.com.tr. Through these sites, he is providing countless useful information related with the construction sector. With yapiilani.com, he is broadcasting many ads under the slogan ?Every Ad is an Opportunity?. And 1insaat.com is the first and the only social and professional networking web portal with over 40,000 members especially tailored to the needs of the construction and engineering sector. 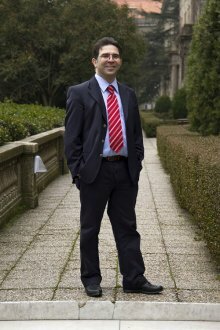 Cem Kafadar also owns a professional blog at https://cemkafadar.wordpress.com/ Cem Kafadar is a board member of the Chamber of Civil Engineers İstanbul Branch. He is being invited as a keynote speaker in several universities, professional chambers and in many different NGOs to talk about the construction sector and internet solutions. Having graduated from Istanbul University Business Administration program in 1997, Gürhan Kalkan has held several positions at Bilgi Group, specialized in documentation systems and consultancy. In those three years of employment at Bilgi Group, Gürhan has worked as a sales representative, network documentation consultant, and as a product manager of Tektronix Professional Printing Systems. In 2000, Gürhan moved to US, state California for enrollment in an MBA program. At his first year, Gürhan gave a break to the program, during the time which he has developed a larger interest for outdoor travelling and wilderness adventure. During his six years of employment at Birch Circle Adventures, he worked as an Operation Manager and a Trainer. Gürhan has been specialized in Swift Water Rescue, River Rafting, and has been instructing Raft Guiding and Rescuing since 2003. As of 2004, he launched his first business ? Nomadic Adventures in California, and served private groups and communities as a Destination Management Company. By 2006, he launched Uyku Tulumu Turizm Organizasyon Ltd.Şti. in Istanbul, to provide land services for Nomadic Excursions as an ?A? class certified travel agency in Turkey. After several years of experience in outdoor and adventure training, Gürhan has developed a sub-brand called Yöne-Team Creative Solutions under Uyku Tulumu and has been providing corporation/company outdoor training solutions since 2006. Adnan Duygun has completed his undergraduate degree in Computer Science, Control and Electronics in Marmara University and then has carried out his graduate studies at Yeditepe University MBA Program, along with Istanbul Ticaret University International Trade Graduate Program and Marketing MBA in the Istanbul University. While holding 3 masters degrees, Duygun is still continuing his doctorate studies at the Istanbul University Department of Management. Adnan Duygun has worked as a Technical Service Manager in Atıl Elektronik Company, then worked as a Sales and Marketing Manager at 3A Bilgisayar, Elektronik, Telekomünikasyon Company, worked as a Business Development Manager at Group 4 Securitas Company, Sales and Marketing Manager at Kulvar Bilgisayar Donanım Yazılım Company, and finally as a Consultant to the Secretary General at İstanbul Genç İşadamları Association. Having also taken certain assignments under the ISO 9001:2000 Quality Management System Start-ups, Duygun is working professionally under the areas: CRM, Customer Complaints, Persuasion and Communication in Sales, Negotiation Techniques, TQM, Management and Organization, Synergetic Management, Problem Solving Skills, Strategic Management and SWOT Analysis, Marketing Management, Sales Management, One-on-One Sales, and International Trade and Marketing.